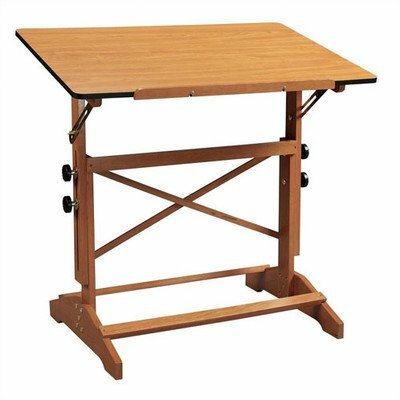 Ideal for artists, drafters and architects, this wood drawing table has an adjustable top that makes it easy to angle to create a more comfortable work surface. Enhanced with a pencil ledge to keep both tools and work secure, the table is finished in cherry and available in your choice of size options. Perfect table for the aspiring artist, crafter or hobbyist. Height adjusts 31 in. to 40 in. & firmly secured by twin adjustment knobs. Board angle adjusts from horizontal (0 degrees) to 60 degrees. Solid wood base construction with smooth cherry-color finish. Cherry wood grain Melamine tabletop includes rounded corners. Supplied with 24 in. wood pencil ledge & brass hardware. 36 in. L x 24 in. W (30 lbs.). 42 in. L x 30 in. W (39 lbs.). Martin Pro-Draft Deluxe Adjustable PEB Board "M" Series 23" x 31"